The first argument after create is name of the folder you want to create for your project. The next argument is the project identifier and the last one is application’s display text. You can see commands for adding more plugins in the ‘Add Plugin Features’ section of Command Line Interface. This completes the process of creating PhoneGap project from the command line. Open the project you just created in Xcode. You will find the project file (.xcodeproj) under project folder in platforms/ios folder. You may want to run the application before making any changes to it. So run the application in simulator and make sure you see the page with ‘PhoneGap Device Is Ready’ text. We will add a native iOS view as the first page in the application (currently it is the PhoneGap view) and add a button to it. When you click the button, it should open the PhoneGap view. First we will add a Storyboard for the application. Open menu File->New->File. In the wizard, select ‘User Interface’ under iOS and then select ‘Storyboard’ icon in the right pane. Click Next. Leave ‘Device Family’ selection to ‘iPhone’. Save the storyboard as main.storyboard in your project (or if you want to create a group and save the storyboard in that group). Click main.storyboard in the ‘Project Navigator’ view. This will open the empty storyboard. We will now add a view to the storyboard. 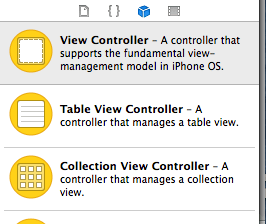 Make sure Object Library view is open in the bottom right corner of Xcode. You can also open the Object Library from menu View->Utilities->Show Object Library. Drag ‘View Controller’ from the object library and drop it on the storyboard. This will create a view in the storyboard. Drag ‘Button’ from the object library and drop it on the view. 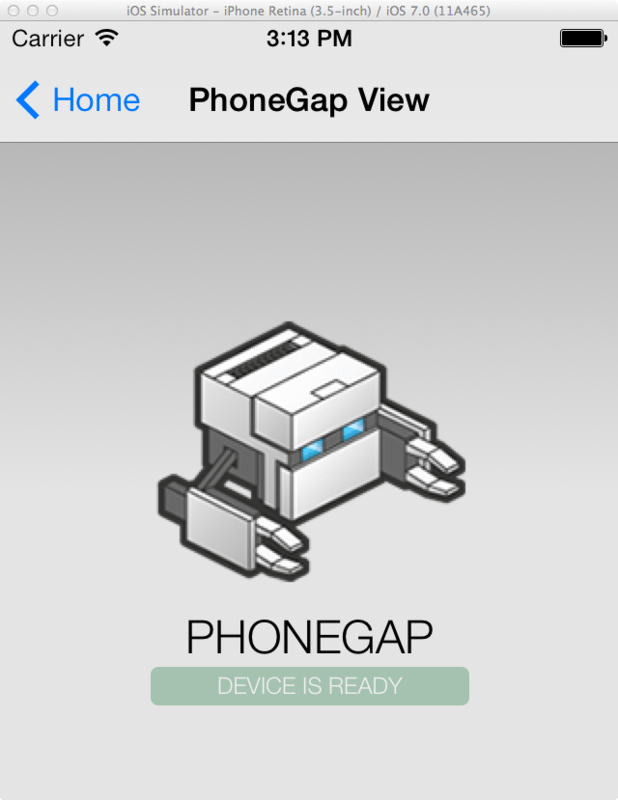 Double click on the button and change the text to ‘Go To PhoneGap View’. At this point if you build the application, you might get error ‘Illegal Configuration. Auto Layout on iOS Version prior to 6.0’. The reason is that PhoneGap command-line has created the project with iOS 5 as target and auto layout is not supported in it. You can verify iOS target for the project by clicking on project name in the Project Navigator. This opens project properties. Click on General tab. In the ‘Deployment Info’ section you would see that ‘Deployment Target’ is set to ‘5.0’. If you want to target you app for iOS 6.0 or above, you can change the value in ‘Deployment Target’ to ‘6.0’. After this change, if you build the project, then the error that you saw above will go away. But if you want to target the app for 5.0 and above, then you will have to turn off auto layout for the view controller. To do this, select ‘View Controller’ node (this node is under ‘View Controller Scene’ node) from outline in the storyboard and then click on the first icon in the top right view to show the ‘File Inspector’. You can also open the view from menu View->Utilities->Show File Inspector. In the ‘Interface Builder Document’ section, turn off ‘Use Autolayout’ option. You may also want to set ‘View as’ option to ‘iOS 6.1 and Earlier’ if you are targeting iOS 5.0. You may have to resize the button after you turn off auto layout option. At this point if you run the application, you will not see the view that we just added. You will see the PhoneGap view that was created by the PG command line interface. This is because we haven’t told Xcode what is our main view. You can do so by going to project properties (click on the project name in the Project Navigator) and click on General tab. In the ‘Deployment Info’ section (the same section where we saw Deployment Target set to 5.0, as explained above), select ‘main.storyboard’ from the drop down list for ‘Main Interface’ field. However this is not sufficient for our view to be the main interface. You can verify it by running the application, and you will see the same PhoneGap view. The reason is that when PhoneGap command line interface created the project, it created AppDelegate class (this class implements framework protocol UIApplicationDelegate and is informed about important events when application is executed) and set it up to display the view created by PhoneGap (through MainViewController class). This overrides Main Interface property that we set for the project. So, open AppDelegate.m (you will find it in Classes folder in the Project Navigator) and go to application:didFinishLaunchingWithOptions function. Comment/delete everything in this function, except the last return statement (return YES;). If you run the application now, you will see the view we just created. If you click on ‘Go to PhoneGap View’ button, nothing happens. We now have to link PhoneGap view to this button. In iOS, you have to define segue to create transition from one view to another – in our case from home (iOS) view to the PhoneGap view. But before we create segue, we have to embed the first view in a navigation controller. Select View Controller from outline in the storyboard. Then select menu Editor->Embed In->Navigation Controller. This will add a navigation controller in the storyboard and link it to the first view. We will now add another View Controller and associate it with the MainViewController of PhoneGap view. So drag View Controller from Object Library to the storyboard. We will now create a segue between the button on the first view to the PhoneGap view. To do this, hold control button and mouse button down and drag and drop on the Main View Controller. Select ‘push’ from Action Segue view. Navigation Controller that we added, creates a navigation bar at the top of the application. We want to display view name for each in this navigation bar. 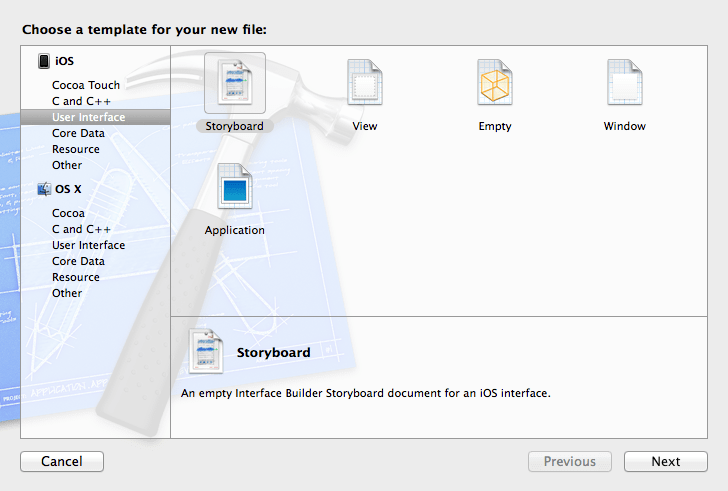 Select ‘Navigation Item’ from the outline in the storyboard for the first View controller. Open ‘Attributes Inspector’ using tool bar shortcut or menu View->Utilities->Show Attributes Inspector. In the title field type ‘Home’. Then select ‘Navigation Item’ for the PhoneGap view controller and set title to ‘PhoneGap View’. Click the button and it should take you to the PhoneGap view. Click Home link and it should take you back to the first page. Appreciates this so much. Keep sharing interesting facts on your next blog. Sir please give me idea about this blog when i click the go to phone gap view button then slide the view bt not display the phone gap view it display only blank screen. It is difficult to tell what could be wrong, but I would suspect MainViewController class is not associated withe the view controller for PG view. Open main.storyboard. Click on the view controller that you added for PG view. In the Identity Inspector (there is a icon at top right with tool tip ‘Show the identity inspector’), make sure Custom Class is MainViewController. My guess is that MainViewController is not called at all. Once you create Phone Gap View, did you change its view controller to MainViewController as described in the post? thanks ram..yes i changed that to main view controller.another one thing to you know is viewdidload of mainviewcontroller method also calling.. If it is of any help, you can download my project and see if it works for you. Do you know of any way to put a link within the HTML to navigate to the native iOS screen, vs. needing the header on top? I tried to intercept urls from the webview and override NSURLProtocol, or create a cordova plugin, but I haven’t figured it all out yet… If you found a way, I’d love to know how ! When navigating back to the PhoneGap WebView, is there a way to preserve page history if our WebView is using a SPA framework? From the example it looks like the WebView is re-created and device ready fires again. Thanks sharing insights. Keep sharing. Awesome post, keep sharing good stuff. Thanks sharing Brilliant insight. Keep it up..